This month, the CFWEP has decided to give our prestigious award to two individuals for the first time. Congratulations to the Butte Chamber of Commerce’s Marko Lucich and Tom Malloy of Butte-Silver Bow City-County as Co-Volunteers of the Month! Marko is the director of the Butte Chamber and has graciously provided his Visitors Center on George Street, free of charge, as a first-stop for visiting classrooms to The Mining City, not to mention the headquarters for the CFWEP’s volunteer training workshops. Marko also gives the CFWEP the key to the Berkeley Pit Viewing Stand, allowing us to bring students to the area’s favorite Superfund site all through the year. Tom is an environmental engineer and the Reclamation Manager for Butte-Silver Bow City-County. Tom has been volunteering with the CFWEP in various capacities for the past few years. Particularly, in the last few months, he has arranged for two middle and elementary school classroom visits to the Anselmo Mine hoist house and mine yard, hosted an environmental studies group from Billings on a tour of Butte restoration sites and, most recently, spent a day in the field with 75 Butte seventh graders on Silver Bow Creek, no easy feat for anyone. 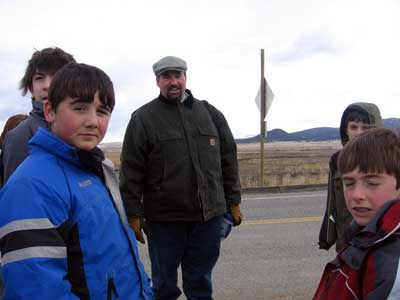 The CFWEP greatly depends on the expertise and cooperation of professional scientists like Mr. Malloy and the flexibility and generosity of local citizens like Marko and his organization in order to successfully continue its educational endeavors with the youth of the Upper Clark Fork Basin. Thank you very much, Tom and Marko!